The Intervale Gleaning and Food Rescue Program completed another successful season of gleaning, food rescue, and Fair Share CSA distribution. Here in the Intervale, we have the great privilege of harvesting perfectly good, fresh vegetables from farms including Digger’s Mirth Collective, Intervale Community Farm, Pitchfork Farm, and Half Pint Farm. We also glean and/or receive crop donations from area farms including Jericho Settlers Farm, Burnt Rock Farm, Maple Wind Farm, Shelburne Farms, Owl’s Head Blueberry Farm, and Yates Orchard. With the help of 3 college interns and 222 individual volunteers who contributed 845 hours of time, we were able to glean and distribute 60,090 lbs of local produce to households and social service organizations through the Fair Share CSA program from July through October. This season, 200 households and 20 organizations were enrolled in the Fair Share CSA. Individual and organizational members picked up their fresh vegetables at the Intervale Center and had the opportunity to sample recipes made with vegetables available in that week’s produce pickup. Surplus from the Fair Share CSA pickups were distributed to area food shelves. At weekly pickups, individuals were able to try new or favorite recipes made with an item from that week’s share. Some of the recipes featured included beet hummus, stuffed roasted butternut squash, and a simple applesauce. Many members expressed that the taste test recipe cards helped them cook recipes that they wouldn’t otherwise prepare themselves. 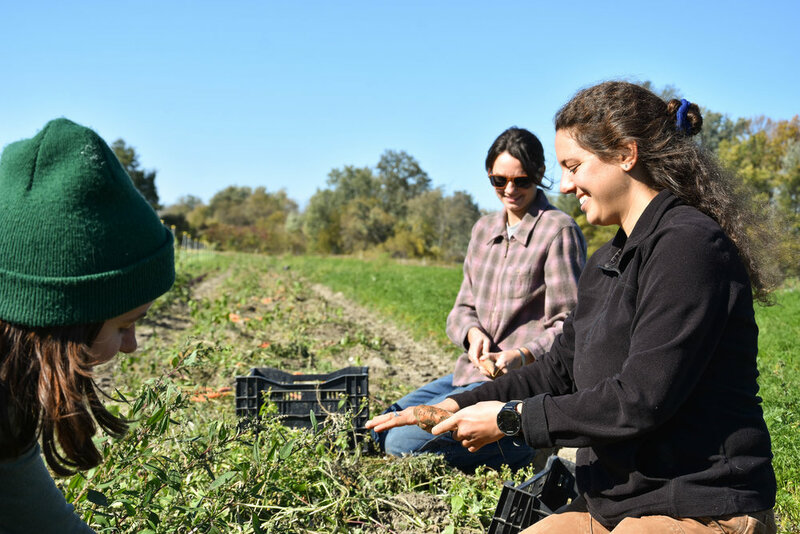 Fair Share CSA intern, Ella Shorr, reflects on the 2018 season and says that she “really enjoyed being part of a community where people take care of each other.” Ella is a Food Systems major at UVM, and states that her involvement in the program “confirmed that there’s so much magic in sharing food,” especially when there is a great abundance of perfectly good fruits and vegetables in Vermont’s agricultural landscape. This year, the Gleaning Program launched its first ever People’s Garden, a pick your own addition to the Fair Share CSA. Members were invited to pick crops to supplement their gleaned veggies each week. These crops included tomatoes, peppers, beans, scallions, and herbs. In addition to providing a greater diversity of fruits and vegetables to the available share each week, the People’s Garden offered a space for kids to interact with crops growing and to learn how to harvest them. Next year, the program plans to enroll the same number of households and organizations, and will plan to offer two share sizes for households and organizations to better meet their needs for produce quantities. We will offer two different seasons, summer and fall, for Fair Share enrollment to better accommodate member schedules and availability. Moreover, we will consider expanding to offer 2 pickup times during the week. The People’s Garden will also expand its crop selection and will offer an additional pick-your-own time for members to harvest crops during the week. Above all, and in addition to these changes, the Gleaning and Food Rescue Program plans to work internally to improve member retention and boost attendance among its Fair Share members. The Intervale Center is looking forward to another great season of gleaning next year!